None of these experiences happened inside an eLearning course or classroom, yet they form a bigger picture of how we really learn at work… 90% informally and outside of traditional training. With the Tin Can API, all of these experiences can be tracked and accounted for. eLearning and training are entering a new age. Image describing Tin Can from the Rustici website. Tin Can API (or Experience API) is receiving a ton of buzz… and looks to make a big splash at DevLearn 2012 as the spec nears version 1.0. ADL commissioned Rustici Software to develop the specification, which looks to supplant SCORM as the go-to eLearning spec of the 2010’s…and then some. The beauty of Tin Can? It actually transcends eLearning…tracking activities we once thought weren’t trackable. At its core, Tin Can is really a series of simple statements: Tin Can delivers data in a Noun, Verb, Object format. Lionel attended “Sales Essentials: Intro Training” with an attendance rate of 100%. Lionel passed “Sales Essentials Written Test” with a score of 92%. Lionel completed “qualified lead sales call” with a result of “success”. Lionel completed “qualified lead sales call” with a result of “failure”. 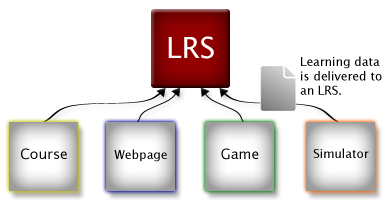 Informal learning activities are reported to the LRS. 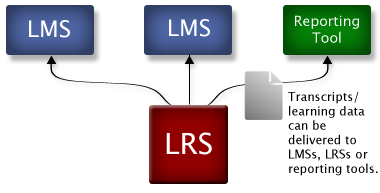 The LRS reports that data to the LMS... or multiple LMSs. 1. Bring big data and eLearning together in ways that were never before possible. Training tracks course attendance and completion, but research shows those activities make up less than .05% of most people’s time at work over the course of a year. Our needs for learning and support are much more varied, diverse, and constant than what formal training can fulfill. Tin Can API allows for tracking of the informal learning activities, both online and offline, that we are all doing every day… and brings them into the training picture as well. In a way, Tin Can brings “big data” into the Learning and Development world. We can track more details than ever before. With all this big data available thanks to Tin Can, who determines the “small things that matter?” Well, the L&D department of course. 2. Get a clearer picture of training ROI than ever before… by tracking more than ever before. L&D departments are constantly fighting battles with upper management to preserve and protect their budgets — and too many of those are losing battles. Surely ongoing learning and knowledge management is an integral part of a healthy workplace culture! Thanks to all of the informal learning activities that Tin Can API enables us to track, L&D will finally have the hard facts and data they need to justify their budgets to higher-ups. Instead of just assuming people had positive results from a learning initiative, the numbers will prove it. When informal learning activities and usage of mobile learning solutions can actually have their results brought in to an LMS, the data can carry just as much weight as the completion percentage for that 5 year old eLearning course. Hallelujah! 3. Unchain the power of mobile devices. Describing an “intangible” new technology like a new API is a tall order… and the folks at Rustici Software are doing a stellar job on their website. A recent post by Megan Bowe and Jeffrey Horne gives the clearest picture yet of how Tin Can works through a series of simple stories. Past training efforts on mobile devices had a number of limitations, the biggest being that LMSs required the training to run through the device’s browser. Yuck! Mobile learning can, and should be better… and Tin Can allows that to happen. Native apps for trackable learning is a big deal… but its worth noting that web apps are also a powerful solution. Simply saving a web app to the home screen allows it to be used much the same as a native app, except it needs internet connectivity at all times to run. Just a factor worth considering when implementing mobile learning. 4. Learning games move from a fun trend… to a practical necessity. Tin Can makes the activities and progress in learning games trackable and easily stored in the LMS. That means the data from games and other “engaging learning activities” can be put in the proper context… right alongside completion data from traditional courses. Gone are the days when a skeptical training manager can say “games are fun, but we need to prove that they completed it.” With Tin Can, you can do that… and more. 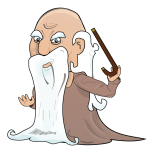 We love the opportunities Tin Can creates for learning games, and we made our Knowledge Guru learning game engine the first Tin Can API compliant learning game. 5. Employees can more easily justify their value by directly tying eLearning they complete to job performance. It makes perfect sense, really. You should get credit for ALL the learning you complete, and not just what the LMS can track. Thanks to Tin Can API, “trackable learning activities” now includes, well, everything. Tin Can API promises to have quite the presence at DevLearn 2012, which is just a few days a way. We will be there as well, promoting the Knowledge Guru. Come see how the game works, and how Tin Can API acts as a bridge between the game’s robust tracking capabilities and an LMS.